The driver can disable the power window switches on a front and rear passenger door by pressing the power window lock button located on the driver’s door to the LOCK position (pressed). 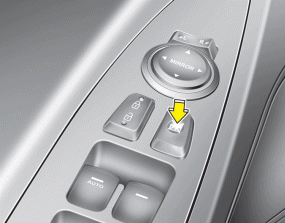 When the power window lock button is in the LOCK position (pressed), the driver’s master control cannot operate the front and rear passenger door power windows. NEVER leave the ignition key (or smart key) in the vehicle.